OKLAHOMA CITY -- LeBron James is making a guarantee about this third Finals appearance: This time there will be no regrets. Though his playoff career has been accomplished, the two worst series of James' career have been his two previous trips to the Finals. Speaking Monday as he and his Miami Heat teammates prepared to face the Oklahoma City Thunder in Tuesday's Game 1, James was confident that trend would come to an end. 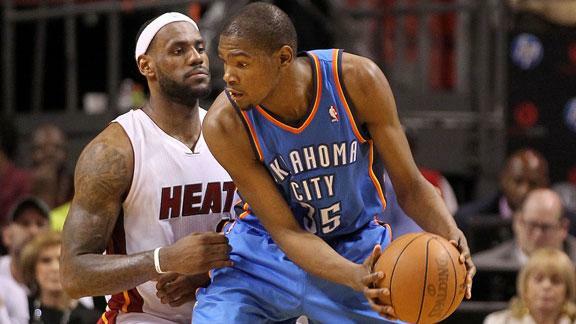 Get all the news and commentary on the Heat-Thunder matchup on ESPN.com's matchup page. "At the end of the day in this series I'm going to play my game and try to do whatever it takes on both ends and make plays," James said at Cheasapeake Energy Arena. "Whatever the results, I'm going to be satisfied with that. I'm going to be happy with it because I know I'm going to give it my all." James was certainly not satisfied with his production in the Finals loss to the Dallas Mavericks last year and plenty of people wondered if he'd given it his all. After averaging 25.8 points, 7.8 rebounds and 6.3 assists in the conference finals, James had little impact in the series against the Mavericks. He averaged just 17.6 points, which was stunningly third on his team. His Game 4 performance, where he only scored eight points as the Heat lost control of the series, was arguably the worst game of his career. James is not hiding from that memory as he prepares for another chance. "I didn't play well. I didn't make enough game-changing plays that I know I'm capable of making," James said. "I felt like I let my teammates down." In 2007, after another brilliant conference finals in which he nearly averaged a triple double, James was stymied by the Spurs' strong defense that forced him into uncomfortable positions. He averaged just 22 points a game for the series -- which remained his lowest average ever until last year's Finals -- and shot a miserable 36 percent as the Spurs got the sweep. That performance has largely been excused because James was just 23 years old and had overcome tough odds to reach that stage. Nonetheless, it is a blemish on his record. "I was young and inexperienced and we had an inexperienced team," James said of 2007. "The San Antonio team did what they wanted." James said he's drawing on the experience of those previous two failures coming into this year when he is facing perhaps the biggest individual battle of his career as he goes head-to-head with Thunder star Kevin Durant. Coming off the most impressive series of his career when he averaged 34 points and 11 rebounds in ousting the Boston Celtics, he's promised he'll have a different mindset. "I'm just at ease now," James said. "I'm happy and I'm humbled that I can actually be back in this position less than 12 months later and to do a better job of making more plays on a bigger stage. So we'll see what happens."